It’s amazing how fast the paper comes into the house. And when it does, I stack it into piles. Piles of paper. In the family room. The den. The bedroom. And that works fine until there’s an avalanche. Which happens more often than I’d care to admit. 90% of that avalanche went to the recycle bin. This weekend I’ll be tackling a few more piles. On another topic, I’m starting footwork on the issue of the Christmas decorations I mentioned here. I’ve already thought of finding a nursing home that could use them. And someone I know had a flood in their home and it wiped out their Christmas decorations, so I’ll share some with them. We don’t get the Christmas decorations out until Thanksgiving is over, so I’ve still got some time. You may have noticed that I’ve slowed down posting frequency. I’m going to take my own advice. I’m simplifying a bit by posting twice a week until the New Year. Have a great weekend! This entry was posted in Uncategorized and tagged christmas, paper, Simple Year 2. Bookmark the permalink. holidays, health, less posts, brilliant! 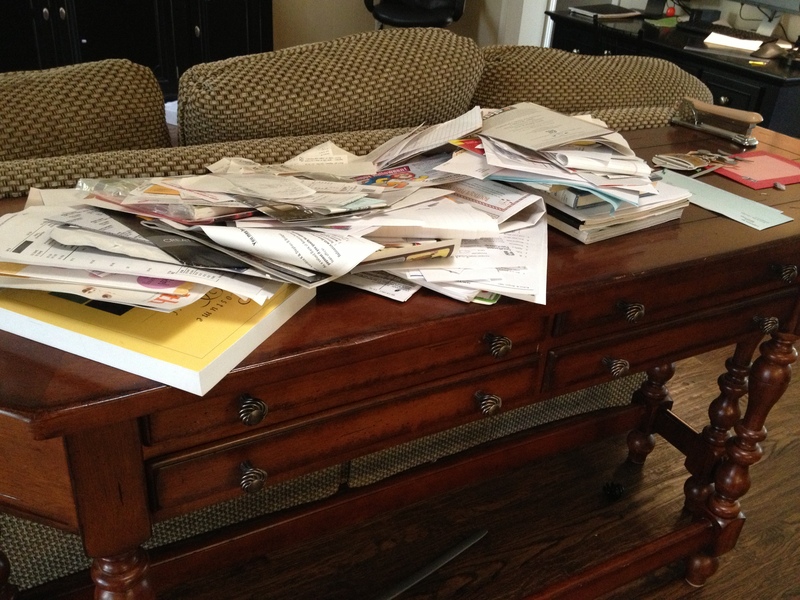 I follow the rule of organizing in that I only let junk mail get handled once. I walk from the mailbox to the recycle bin. The catalogues (which I try to call and ask to be taken off the list), junk mail, etc. don’t get set down anywhere in the house. The mail is all sorted over the cycle bin. It’s great. Paper…It’s a constant battle. : ) Enjoy your “simpler” holidays! Paper is always a battle, I swear. I can’t ‘think’ without certain work things in hard copy, and I wish it was otherwise!! I like to create pads of paper where one side has been printed on – I don’t use them as quickly as I generate paper, but hey, it’s a step in the right direction. Maybe I need to do some paper mache? Junk mail isn’t too much of a problem here in the UK, our post comes through the letter box and I sort junk mail straight into the recycling bin. Then I open the remaining mail and put it into the various piles – to deal with immediately, health related invoices into a “scanning and claiming pile”, and the rest of it into another pile called “filing”. Its that “filing” pile that grows and grows, until I have an attack of guilt, get out the files and put it all away. And guess what? It never takes very long and I don’t know why I procrastinate, but perhaps I should just let that one go. I’m good at recycling, keeping the house decluttered and quite a few other things, so perhaps I shouldn’t beat myself up about a few pieces of paper sitting in a neat pile in the guest room. I hope you have a lovely Thanksgiving with your family, and that you give yourselves breathing room. Your house will be ready for sale by the peak selling season, and I’m sure its already tidier than the majority of the houses that we viewed here in the UK.